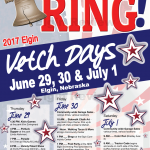 Summer hours at the Elgin Public School office have been announced. They will be 9 a.m.-3 p.m. Monday-Thursday. The office will be closed on Fridays.